The Swiss civil aviation authority is investigating a bizarre incident during a hang gliding flight. On a video which is making the rounds on the internet you can see how the pilot of a hang gliding flight forgot to fasten his passenger before the start of their duo flight. As a result, the US tourist hung for more than two minutes only by his arms dozens of meters above the Swiss mountain landscape. The passenger, American Chris Gursky, happlily placed the GoPro images of the incident on his YouTube channel yesterday. Since then, the video has been viewed more than 4 million times. You can see how Mr Gursky (who is on his first holiday in Interlaken) and the instructor getting ready for the flight. One tiny detail though: the safety harness of the Mr Gursky is not attached to the frame of the hang glider. After the men have run away for the start and are hanging in the air, the problem quickly becomes apparent as instead of horizontal, the passenger hangs straight down. With one hand, he manages to hold on to the back of the instructor, with the other one he holds the metal rod of the kite. 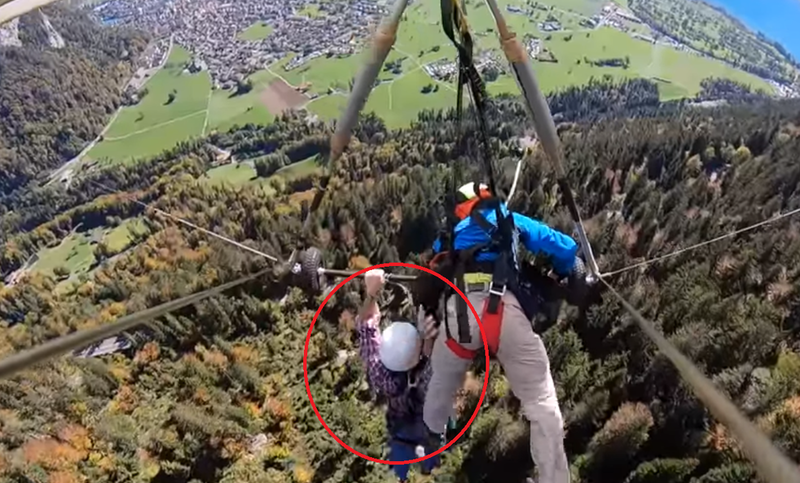 Watch as a hang glider clings on for his life after the pilot fails to attach safety harness. Chris Gursky was on holiday in Switzerland when he decided to see the sights from above. Not much later, the unlucky tourist sinks further down. Instead of the back of his companion, the American is now stuck to his trouser leg. He hangs on for more than two minutes, tens of meters above the ground. The instructor manages to keep the hang glider in check and lands safely on a lawn nearby. The passenger has already fallen into a field by that time. Mr Gursky, who lives in Florida, claims to have broken his wrist during the fall. A tendon in his left arm is also torn. He showed the X-rays to a local press outlet. The Swiss aviation authority now proposes to reconstruct the event and to question both the pilot and any possible other witnesses. Mr Gursky does not understand why he was not secured, but he does not want to blame the pilot. "The pilot did everything he could to save me. He tried to hold me and at the same time steer with one hand." why didn't the guy grab onto the bar with his right hand too? then when he let go at the ground, he should have stayed with the glider.